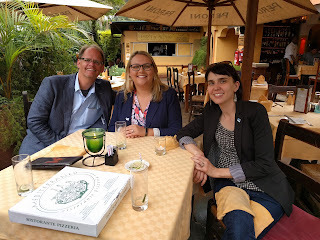 In May 2017, while attending the XXI Congress of the Association for the Taxonomic Study of the Flora of Tropical Africa (AETFAT), Smithsonian Libraries' (SIL) staff Martin R. Kalfatovic and Carolyn A. Sheffield received a speaking invitation from the Embassy of the United States of America, Nairobi, Kenya from Tatum Albertine (Environment, Science, Technology & Health Officer). The Embassy is located in Gigiri, north of the Nairobi central business district, about a two hour drive in Nairobi traffic from the Karen neighborhood where the AETFAT Congress was being held. The program was held in the American Reference Center (ARC) on the Embassy campus. The ARC serves students, teachers, researchers, journalists, business professionals and individuals simply interested in broadening their horizons on any topic. The purpose of the talk was to provide a wider Kenyan community with information about the Biodiversity Heritage Library and services provided by Smithsonian Libraries to Smithsonian researchers that could serve as a model or inspiration for similar services to the broader research community in Kenya. There were invited guests from National Museums of Kenya, the Kenya Wildlife Service, Nature Kenya: The East African Natural History Society, and the National Commission for Science, Technology and Innovation (NACOSTI). 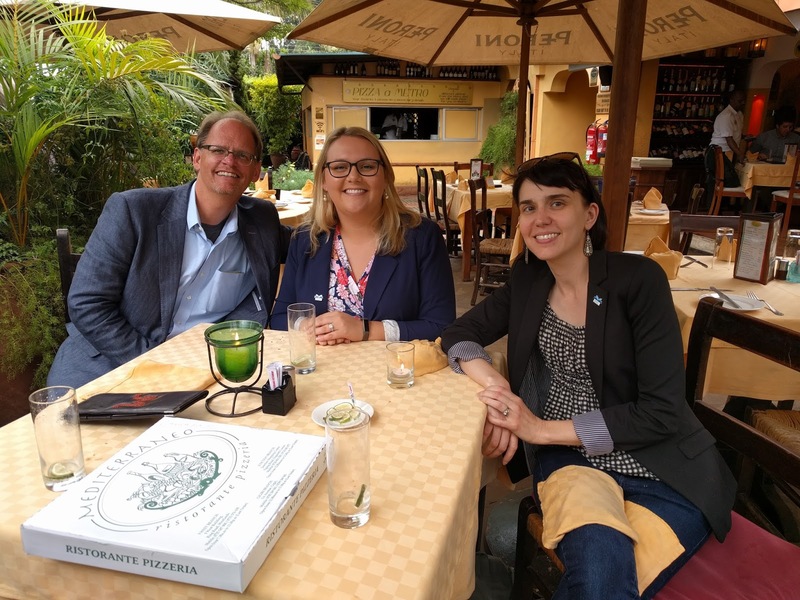 In addition, Albertine worked with ARC Deputy Director Nashon Akello to publicize the program widely with the university community and faculty and students from both Kenyatta University and the Technical University of Kenya. Information management and data analysis towards scholarly publications is very important indicator of a nation's development and reflects the potential of a nation to harness its human resource in solving problems of mankind. It also broadens the horizons of policy thinking and in addressing many critical issues the government faces. As a policy making institutions, scholarly publications will be very important in advising the government accurately. Therefore, your invitation of our institution was timely because this is one of the areas needed to be harnessed in advising the government by policy directions using real data. 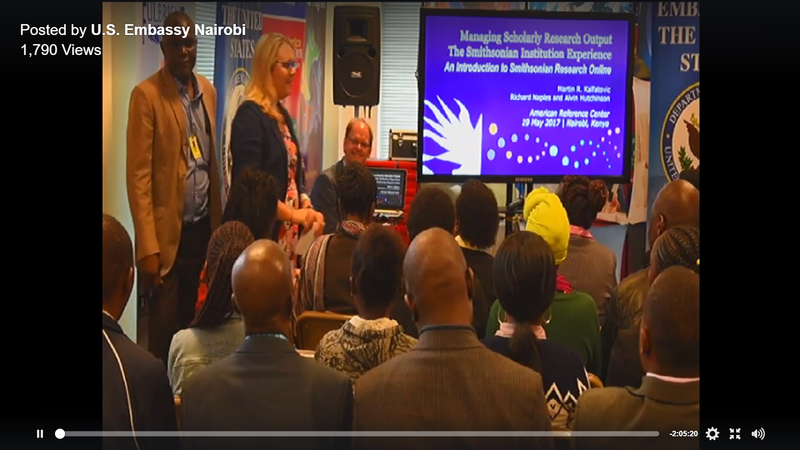 Most research organizations in Kenya, as well as agencies who regulate research, are struggling with the challenges of tracking and making available the results of research. The tools that Smithsonian Research Online have used could be readily adapted for use by some of these organizations. Given the overlap of interests of many organizations in biodiversity research in Kenya, I also hope these presentations catalyze discussion of the possibility of a multi-organization collaboration to create a centralized data archive that has multiple portals to serve different users. Carolyn A. Sheffield, BHL Program Manager, presented on "Inspiring Discovery Through Free Access to Biodiversity Knowledge: The Biodiversity Heritage Library (BHL)." Sheffield covered a general introduction of the BHL as well as recent accomplishments and metrics related to Kenya and Africa. BHL Africa colleagues, Asha Owono and Ben Nakitare were in attendance and provided additional support in relation to Kenyan participation in the BHL during the question and answer period. A participant from the Kenya Wildlife Service noted: "The lecture and demonstration were very encouraging and I have the feeling that this if pursued more vigorously can enhance information sharing within the conservation field in this country and the world at large." Again, as Dr. Miller commented during the planning for this presentation, "This program is important for several reasons beyond helping users understand how to use the Biodiversity Heritage Library (which is important in itself). Kenya is poised to make significant additions to the BHL. As was discussed at the Laikipia landscape workshop in February, there is a rich history of 'grey literature' in East Africa on agriculture, wildlife, public health, etc., that is not available to most people today." The ARC was filled to capacity with sixty attendees. 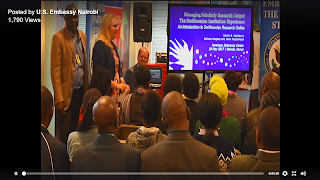 The Embassy social media team led by Amos Rono also presented the program as a Facebook Live broadcast as well as live streaming it to other U.S. Embassies in East Africa (see link below). Smithsonian Libraries and Biodiversity Heritage Library social media team also promoted the event. Thanks to ARC Director George Kamau and ARC Deputy Director Nashon Akello for hosting the program in their space and Dan Travis (Public Affairs Officer), Megan Larson-Kone (Cultural Affairs Officer), Alka Bhatnagar (Information Resource Specialist), and Pushpinder Dhillon (Economic Section Chief) on the U.S. Embassy staff who worked to make this program a success.